Evening in Paris, Soir de Paris in French, was a popular scent by Bourjois distributed in signature cobalt blue bottles. Most anyone coming of age from the late 1920s through the late ‘60s will likely remember Evening in Paris. Many who don't remember someone in their lives wearing the scent have seen EIP items for sale at antique shops, shows, malls. Anything with the Evening in Paris wording or logo – compacts, ad pages from magazines, store displays, and a host of novelty perfume holders – capture the attention of dedicated EIP aficionados in addition to those famous blue bottles, most of which are marked Bourjois on the bottom. First introduced in the United States in 1929, EIP was popular from the beginning. There hasn't been much information compiled on these popular collectibles in the way of reference material, but a booklet put together in the mid-1990s by Sue Mattioli and Bev Nelson simply titled "Evening in Paris" provided a bit of information on Bourjois, discussed pricing EIP collectibles, and showed catalog/magazine reprints. Looking up vintage ads can be a great way to date EIP items. Mattioli and Nelson attributed EIP's phenomenal success largely to marketing techniques that made the fragrance available to all women. The cologne sold for 25 cents in dime store bottles, and in pricey crystal bottles with glass stoppers in fine department stores. This accounts for the wide variety of collectible items available ranging from commonly found purse perfumes with corded tassels to rare novelty items. The Evening in Paris booklet also noted that some of the most popular items with collectors are the graphic boxed gift sets from the '30s and '40s. These turn up as originally inexpensive one- or two-piece sets all the way to large elaborate sets of eight or more items in beautiful satin-lined boxes in fanciful shapes. Prized by EIP enthusiasts are novelty items such as bottles sold on cardboard Christmas ornaments and other interesting bottle holders like Eiffel Tower replicas, high heeled shoes, Bakelite owls, plastic clamshells, and even a champagne bucket. As for the cobalt blue bottles alone, from a collecting standpoint, there seem to be far more styles produced during the 1950s on the secondary market than those from earlier eras. Although any EIP bottle is deemed collectible, those ‘50s bottles don't sell for quite as much as the earliest examples. The perfume bottles with stoppers sold in upscale stores are also more desirable since fewer of those were made and sold in comparison to the dime store varieties. One advantage EIP bottles have is being free of chips and cracks since they were made of very thick, durable glass. Most of the EIP items collectors encounter have been used and some quite heavily. Often carried in purses or used daily on dressing tables, many bottles have worn or missing labels and less than perfect caps. Some of the purse perfumes are missing their decorative tassels, or those embellishments have become very worn and frayed over time. As with most other collectibles, the condition remains important in retaining value. The bottles are still even if the label is missing or the cap shows its age, but keep in mind that top dollar should be saved for mint condition purchases. Keep in mind that upright bottles missing their caps aren’t worth much unless you want to use them as tiny bud vases on a window sill. A lucky point for collectors is that gift sets seem to show up on the market fairly often in excellent to near-mint condition. 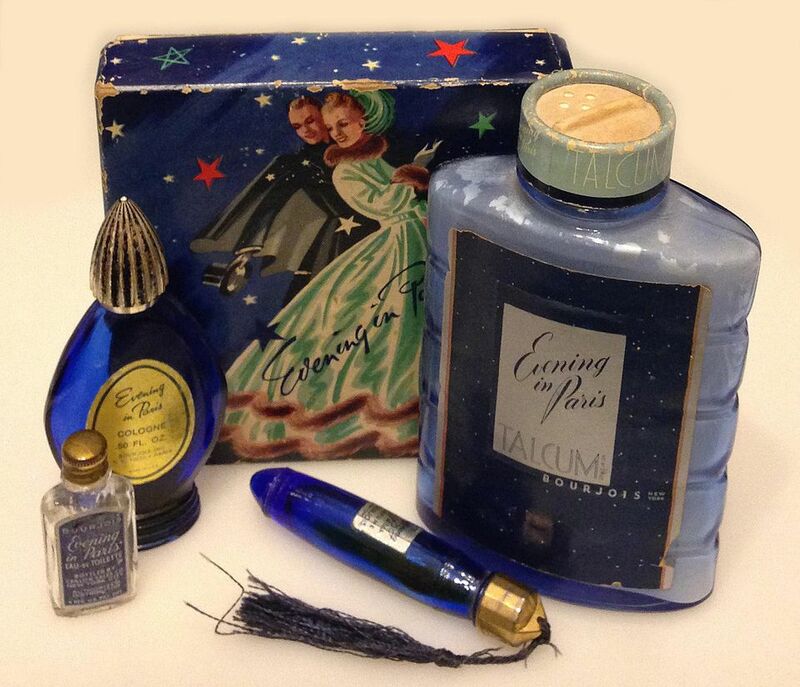 A complete box lined with satin filled with the deep blue bottles and nicely decorated accessories is striking and they were quite a prize when received as a gift decades ago. Collectors find that even when those satin-lined boxes are worse for wear after being shuffled around for decades, they served to protect the contents within and the bottles, talc tins, and compacts they hold are still gorgeous. Bottles that are like new, sealed, and unopened bring a higher price than those half full of product or completely empty. If you find a bottle in a rare style, you’ve got a treasure an EIP collector or perfume bottle collector will pay a pretty penny to own. Novelty packaging often brings a fairly high price on the secondary market when it’s found in excellent condition. Take the plastic clamshell containers that held a bottle of EIP. If the plastic is in super condition, even without the original bottle inside, these can sell for $150 to $250 depending on the color. A Bakelite owl container from the 1930s with the original bottle intact most always sells for $100 to $150 or more. In comparison, a rare gift set might sell for $250 to $300, but more common sets can be found for less than $100 in very nice condition. Those without lids or in extremely worn boxes are often a bargain at $25 to $50. Mint condition compacts are also prized collectibles. There are only so many to go around since they weren't as widely produced as the cologne bottles. Like the bottles, they were often carried in handbags so the condition can be less than perfect more often than not. Expect to pay $50 to $75 for these in excellent condition, and perhaps more depending on the rarity of the style. They’ll fetch far less if they’re scratched and showing their age.